The five-star Abadia Retuerta LeDomaine is a gem of a getaway hotel in northern Spain's Ribera del Duero wine region. Opened in 2012, LeDomaine occupies a majestically renovated 12th-century Romanesque abbey where well-born monks lived. • The hotel is a member of the deluxe France-based Relais & Chateaux hotel association. • Top awards like TripAdvisor's #1 Hotel in Spain 2016 and inclusion in "50 greatest hotels in the world" in the UK-based Telegraph. 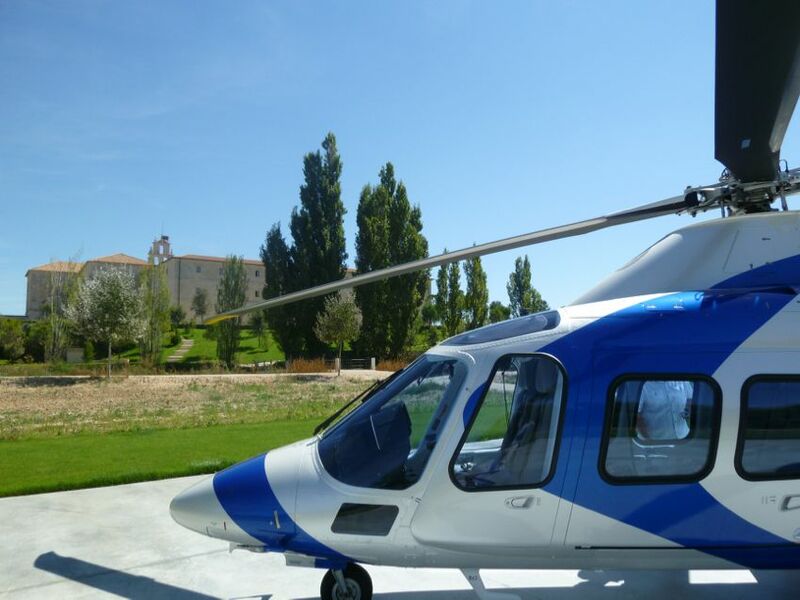 What Kinds of Luxury Travelers Steal Away to Abadia Retuerta LeDomaine? "LeDomaine" furnishes an ideal luxury getaway for Brits, Western Europeans, and for North Americans. It appeals to upscale couples interested in luxury, design, history, food, wine, spas, and outdoor recreation. • Superb dining at Michelin-starred Refectorio restaurant. • A setting amidst over 500 acres of vineyards, with all sorts of tasting opportunities, making it a mecca for oenophiles. • The privacy and individualized service you get in a private-feeling boutique hotel with only 30 rooms and suites. LeDomaine is two hours from Madrid by car and 90 minutes by train. Or you could catch a connecting flight to Valladolid, a half hour away. Check LeDomaine's special offers online. Will You Like Abadia Retuerta LeDomaine? Will Abadia Retuerta LeDomaine Be Your Best Getaway Hotel in Spain? • You love your luxury accommodation to come with a long and fascinating back-story (900 years of history here). • And you will like the simplicity and perfection of rooms that were once aristocratic monks' cloisters. • You'd relish dining on delicious Michelin-starred cuisine in an incredible setting. • You enjoy Spanish viños (fine red, white and rosé wines are produced right here). • You want to be surrounded on all sides by beautiful nature for long walks and cycle rides. • You will make the most of the vast spa and gym and indoor and outdoor pools. • You prefer the nonstop excitement of Spanish cities to the quiet solitude of its countryside. • Or you like big, bustling hotels. • You want a resort with a kids' club and activities (children are permitted, but not catered to). • You want to be close to a major airport. • You're thinking of a winter holiday; LeDomaine closes from mid-December to March 1. Abadia Retuerta LeDomaine is absolutely unique in the world. Even guests who visit luxury resorts regularly are in for a one-of-a-kind experience. The beauty begins with the setting. The resort is situated in the Ribero del Duero wine region of Castilla y León, famed for its delicious food and various wines. • Surrounded by vineyards and bordered by mountains, the resort immerses guests in rural beauty. • Opulent furnishings, lighting and climate control blend seamlessly with 900-year-old architecture. • So much so, the hotel was given the EU’s Europa Nostra Award for conserving cultural heritage. • The surrounding estate has been busy making wine for LeDomaine since at least the 13th century. LeDomaine is a big property -- with only 30 rooms for pampered guests. The hotel offers 17 Classic Rooms of around 350 square feet, 10 Superior Rooms and three lavish suites including a honeymoon suite. At over 1,000 square feet, the classically-designed Master Suite is the top room option. • It features a big bedroom. living room, marble bathroom, powder room, walk-in closet. • Toys include two TVs and a Nespresso machine. Every room offers tailor-made walnut furniture, a large bathroom with a soaking tub and walk-in shower, comfy beds with a vast choice of pillows, and soundproofed walls. • The best feature of all? Endless views, even from the bed, of the surrounding vineyards. • Free wifi, bottled water, and a complimentary minibar with sodas and juices. • Downstairs in the lobby, chocolates await. Service here is absolutely five-star hospitality service. You will feel welcome and honored, but not smothered. Butlers are the centerpiece of LeDomaine's service efforts. Every room at LeDomaine comes with a dedicated butler. • This is the only hotel in Spain with private butlers. • They sense what you want before you ask for it. • One flourish appreciated by guests: unpacking and packing. From mouthwatering breakfasts to Michelin-star dinners, the restaurants in LeDomaine are second-to-none. Without a doubt, the big-deal dining experience at LeDomaine is the extraordinary Refectorio. Set within the medieval vaulted refectory (dining room) of the monastery, this is a dinner with potent atmosphere -- and food to match. My wife and I were eager to sample this innovative Spanish chef's art. We chose the seasonal tasting menu. • It kicked off with a fresh Gillardeau oyster from the Atlantic coast of France, served with a bright citrus-and-herb juice. • Our favorite main course? Braised baby lamb with a sweetbread stew and seasonal mushrooms. • For dessert, we relished roasted figs with almond praline, then the assortment of artisanal cheeses. • Every dish served was not only a pleasure to taste but beautiful to look at. • Get hungry for Refectorio's menus. Refectorio's extensive wine list spotlights the property's own award-winning Abadia Retuerta wines. Some are grapes you know, and some are indigenous varietals that convey novel pleasures. In warm weather, the property's courtyard offers three meals a day under the Spanish sun (and shade umbrellas). • The menu is fresh and seasonal. • Choices range from salads to Iberian cured meat platters to traditional rice and grilled dishes. Breakfast is served in Refectorio, where you’re treated to a basket of pastries along with your breakfast dish. • Along with the strong coffee, your server brings you the morning news printed in your mother tongue. The Santuario spa café serves light, delicious dishes that spotlight local produce and favors. At LeDomaine, you never forget for a moment that you are staying at a working winery and a very good one at that. Abadia Retuerta wines are known throughout Spain and amongst wine lovers. Guests at LeDomaine have many opportunities to enjoy the estate's wines. Set above the wine cellar, the romantic Vinoteca houses LeDomaine's private wine collection. Here, you can taste numerous wines and enjoy a meal. At LeDomaine's wine boutique, you can buy estate bottles to take home. Many come in lovely gift packaging. The resort's place to unwind and tone up is Sanctuario LeDomaine, a wellness center with a great gym, pools, and a one-of-a-kind spa concept. Opened in 2015, Sanctuario LeDomaine is a super spa. • It's set inside the former stable of the abbey. • And it's now one of the biggest hotels spas in Spain. We all know that wine is therapeutic. But Sanctuario takes this truth to new heights. Its “vinotherapy” spa concept is unique and irresistible. Other wine-region hotels offer vinotherapy, but LeDomaine's Spa Sommelier is an industry first. Here's what it was like when my wife and I visited Sanctuario. • Under the Spa Sommelier's guidance, we blind-tasted three signature wines and decided which we liked most. • Then we chose massage oils with similarities to our favorite vintages. • The suite has a private hammam and sauna. • First, we were treated to a Pure Detox Wrap Experience, where we were scrubbed with sea salt and lemongrass, then wrapped in a cocoon of Spirulina micro-algae to release toxins and purify the skin. • Following a shower, our second treatment was a rough but rewarding deep-tissue massage from scalp to toes. • This was one of dozens of healing treatments and beautifying rituals performed at Sanctuario. How to Stay in Shape at a Resort With Michelin Dining? Guests keep in shape at Santuario's state-of-the-art gym. • It offers all the latest equipment by Technogym, TRX, Bosu. • A Kinesis circuit takes you through the program with an on-screen instructor. • Cardio machines feature custom music feeds. • You'll also find studios for yoga, stretching, barre, and more. Sanctuario offers two relaxing pools. • The small indoor pool is ideal for a dip. • The larger outdoor pool is made for swimming laps -- and for lounging poolside. Guests can opt for a fitness and wellness services during their stay. A program offers a fitness evaluation, daily training session, daily yoga or Pilates session, and more. • Or you can book a trainer or meditation leader for sessions of your choice, in a private studio. The sun shines most days at LeDomaine, and there are lots of ways to fill your time. The hotel's concierges are eager to help guests discover this magnificent estate. You can explore Abadia Retuerta's trails on foot or on bikes (lent free to guests). • Paths criss-cross the hotel’s 1,730 acres of farmland. You can follow the same paths on a horseback trail, or get a bird’s-eye view with a helicopter spin over the property and surroundings. Many guests come to LeDomaine with a love of wine and leave with a knowledge of it. • The property offers winemaker tours around the vineyards, winery, and cellars. • And you can also take a wine-tasting course (in English). • If you’re staying at LeDomaine during the fall, you can be a part of the grape harvest. More fun stuff at LeDomaine: you can take kitchen lessons from Refectorio chef or watch the property's falconer hunt with the property's lightning-fast birds of prey.